Writing '400 words about myself' is not easy because I am a work in progress, and when the rate of reworking thoughts and ideas is high, it is difficult to crystallise - even temporarily - a clear statement. So this will have to be a working draft, rather like a working drawing: provisional, drawn over, washed off, and redone from time to time. And the documenting never seems to keep up with events. Also, as this project is about conversations, writing in a conversational tone may help invite dialogue. Art and biological science have been interwoven in my practice for a long time. Bones, skeletons, connections, articulations, optimality, theoretical models and back again to physical form. More recently I have become interested in the way the art world works, especially the ways in which education and fashion affect separation and coalescence of groups of artists, sometimes promoting communication and sometimes limiting it. I am intrigued by the way dogma tends to grow over experience like a fungus. I studied in the US, Canada & the UK, and completed an MA in Fine Art at Central Saint Martins in 2006. Concepts and material properties are both important, and I use a variety of media to express ideas. 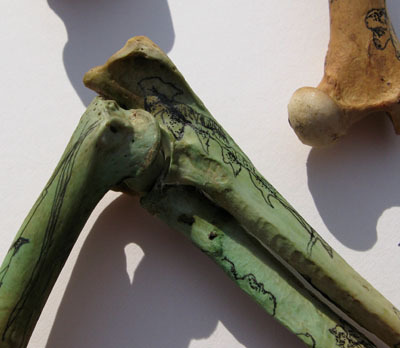 Tattooed Fox - on fox bones - incorporates drawings of animals, plants and fungi from locations where this particular fox lived and later made its journey to skeletal form. 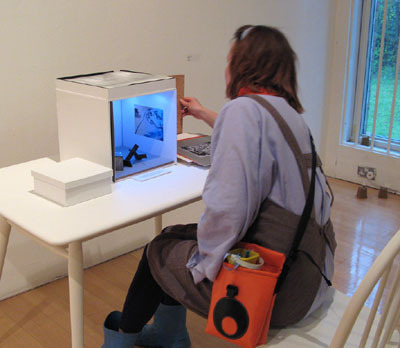 Some work is interactive, for example Curation Play in the exhibition At Play at South Hill Park, which addresses fashion and preferences in gallery style. Journey into Space, in ReOrsa's 2008 project in Bracknell, invited visitors to visualise travelling across a semi-fictitious landscape, and trace their journey on a large communal drawing. The landscape was derived from an earlier project Interstitial Space, which investigated hidden spaces on a rocky seashore. An ongoing project called Fluid Mosaic pops up periodically at different venues to explore people's perceptions of the art-science interface.